Oracle SOA Tutorial | What Is Oracle SOA? The demands of the modern world require complex IT landscapes with various disparate systems, applications, and multiple platforms. The need to integrate with cloud platforms, mobile-enable the existing applications and begin developments on the latest trends by connecting the Internet of Things (IoT) devices to the current infrastructure comprises the main focus of organizations. The effective SOA framework brings together the on-premise and cloud deployments to ensure the perfect flexibility of the organisation. The overall development helps to orchestrate the services of the diverse systems. This is where Oracle OSA comes in. It stands among the dominant middleware platforms in the market. It is the most popular platform for the complex application integrations. How the concept of SOA influences technology? Oracle SOA Suite enables the developers to build the services and manage them. The services can then be applied to the business processes and composite applications. Organizations can easily extend and evolve the architectures with the hot pluggable components from Oracle SOA Suite. Replacing existing investments would not be required. The product strategy, product details, and customer experience relating to the SOA Suite are shared by Oracle Corporation. The release of the Oracle SOA Suite 12c was announced in June 2014, which is the latest version at present. It promised simplified mobile, cloud, on-premises and Internet of Things (IoT) integration capabilities. The latest version available at present is Oracle SOA Suite 12.2.1.3.0. The Quick Start version for the generic platform and the other platforms meant for the cloud integrations are available as well. Learn Oracle SOA Training Expertise in Building Composite Applications, Architecture & Administration. Enroll for Free Demo! The development of the Oracle SOA Suite was done to cope with the goals of infrastructure flexibility, business integration, increased applications, and reduced costs. The disparate requirements of cloud, mobile, and IoT integration are simplified by the products into a unified and standards-based platform. The Oracle SOA Suite 12c enables you to get certain benefits. They are as follows. The IT firms should be able to face the challenge of taking on the array of software systems that might not be compatible. The IT companies might even have to face the demands put forward by a wide array of customers. Customers are accessing products and services through online interfaces and are a part of a supply chain where the cost and time of production need to be decreased. This is why IT companies are always looking for solutions to meet the demands. But, why is the technology surfacing only now? One of the main necessities to build a system is to have a standard for representing the software parts. Though SOA is not something entirely new, there have been many standards set up by the Internet, like HTTP and HTML. Businesses that have witnessed the growth of the Internet are using similar principles to get the computer systems linked. Though SOA is not a technological concept, the idea has been adopted by technologists. The concept of software services has been established through this. It is performed by a software program. The efforts offer value to the people or organisations who consume their products. The software services can be provided over the Internet. The services on the web could have virtual interfaces. The internal networks of the enterprises can be used for delivering software services. There are major benefits earned by the use of services, and they are as follows. The large applications are much like 'information silos' where a ready exchange of information is often not possible. Fine-grained software services offer a better and refined flow of information between the companies. While the major applications prove to be costly, SOA is very inexpensive in terms of integration. If the internal software is organized as services, exposing the functionality externally is easier. The increased visibility would offer business value. This can help increase customer satisfaction and reduce the overhead costs. The supporting software makes the businesses rely on them. The large and singular programs can be hard to change as the lack of modularity would make them difficult for the enterprises to meet new changes. It might even lead to the inability to take advantage of new opportunities. A software architecture based on services is easy to change as it would offer better organizational benefits and help to avoid penalties. Re-use of ServicesCosts involved in testing and developments can be lowered by the use of existing software modules rather than writing new ones. This would ensure lower maintenance costs and better savings. Messaging: Use of messaging would enable services to move between the computer systems inside the enterprise. The externally-provided services would be easy to use. The messages handled by the services can be changed to meet the new demands or the performance can be tuned. Message Security: Message security involves data integrity by the addition of cryptographic integrity-check fields and data confidentiality by encryption of messages. The improvement of security and management - security event detection and performance measurement are keys. Oracle SOA has a series of features that help in integration with the other platforms. The unified platform meets the growing demands of faster business integration. The Suite can support all the technology trends of today. The adapters are classified into different categories like enterprise application, CDC and mainframe, cloud, and the SOA Suite Adapters depending on the systems and applications. One of the most exciting features involve the Oracle cloud adapters that offer simplified connectivity with SaaS applications through the processing options and design-time wizards. There had been room for improvements that require architecture for web services and the cloud adaptor configuration wizard, and adapter SDK i.e. the Software Development Kit does the job. The SDK allows the users to use the new SaaS applications as a part of the business processes of the companies. Run time and design time components are offered by the SDK. The run time APIs include security API, session API, and transformation API. The design-time components include metadata browsing, connection API, artefact generation, and query support. A simplified view of the business object is offered by the cloud adapter configuration wizard. The users can browse the services and objects and select them to perform the supported operations. The adapter can be used to distinguish between the objects and the applications. Oracle cloud adapters validate and provide the design time query editor and test the queries. Test cycles are shortened when they are integrated with applications. The cloud integration adapters from Oracle even enhance the complexity and improve the time of data mapping. The significances of integrating with SaaS applications like handling complex web services description language or session management can be addressed within the adapter instead of exposing the user to the issues. Though the Oracle SOA 11g was quite unified in its interfaces, the Suite 12c has a unified interface over all the components. The Oracle WebLogic Server offers a platform for the Oracle SOA Suite. The integrating components offer reliable integration. Oracle allows the deployment of more applications per server, reducing the hardware and energy costs as well as software licensing. The JDeveloper tool from Oracle SOA Suite would support the tools and technologies within a customizable yet single user interface. JDeveloper is integrated with the SOA Suite, allowing the users to deploy without a hitch in the test environments. Only one tool is needed which reduces the need for integration. It is of crucial importance to keep a not of what is happening in the application servers and the occupant applications and scale applications when necessary for managing the integration. The SOA management plugin and Oracle Enterprise Manager offers the capabilities in a web console. The users can browse applications, servers and service engines to troubleshoot the run time problems in SOA. The Enterprise Manager works with the Oracle Web Services Manager to define and apply security policies for the components and services. To minimise the job of the users from design to deployment in implementing the new interfaces, prebuilt integrations are offered by Oracle. The users can look for the business objects and select them and deploy these without getting tangled with the technical details. The innate integrations or the modified ones can be used to meet the project schedules and the specifications. 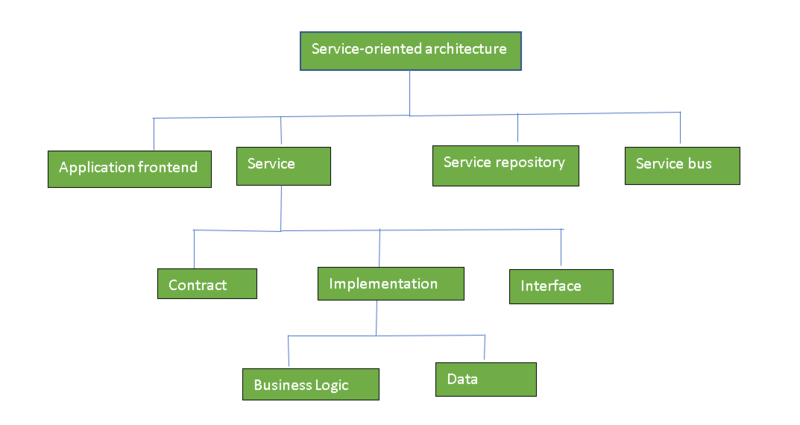 Service Oriented Architecture, as a primitive goal, helps to align the businesses with the technologies. This means greater business agility, extensible and flexible architecture, enhanced workflows and better life of the applications. Thus, there can be significant benefits of SOA, and they are mentioned below. The location transparency is a term that describes that the consumers of a certain service would not worry about the place of implementation of the services. The server could be the same or one that is halfway across the world. The consumer calls do not interfere with the service location. The principles of loose coupling are very crucial in the field of SOA with applications based on information technology. This involves avoidance or encapsulation of technological, temporal and the organizational constraints in the design of information systems. Dynamic binding or late binding is supported by a loosely coupled system. It can mediate the difference in the security model and the structure of the component, semantics and protocols, which means volatility can be abstracted. Services can be implemented with the help of loose coupling with any significant impact on other services or applications. The interaction that would take place between the services and the application would be through the publish interfaces. This frees the application from worrying about service implementation. Advocation of more parallelism takes place in the development of the services as SOA uses a layer-based architecture. The contract-based services that are present in the inventory of SOA are independent and parallel development is possible. The layer-based architecture that is conferred by SOA allows testing to be broken into definable testing areas like security, services and governance. The testing areas would be separate using the right tools and approach. Test suites can be created with NUnit and JUnit, for instance. A number of procedures are contained in the test suites, which are designed for testing the components and services. Automation of testing helps to bring modifications to the enterprise services that improve the efficiency of regression testing. Individual clustering is possible with SOA allowing appropriate balancing of load that scales the system up. SOA can achieve redundancy through the introduction of redundant elements through the method of clustering and this redundancy holds the key to higher availability. Compliance to the web services means that applications executing on a platform would be able to consume the services from another, facilitating reuse. If SOA applications are implemented properly, it is possible to reuse services in heterogeneous environments like Java, C, C++, .Net and others. The Service Oriented Architecture offers an architectural approach for the applications in a network to make use of the available services. A communication call over the Internet offers the required services to the applications. SOA allows the users to combine various facilities to form applications from the existing services. The SOA-based computing packages can be integrated into the various software systems in the form of a set of interoperable services, even if they belong to separate business domains. SOA involves a set of design principles, which offers the necessary system structure and offer the means of integrating the components in a decentralized and coherent system. Service provider - The service provider has the responsibility of maintaining the service and the organisation that makes one or more of these services available for the consumers. The service provider can publish the services in a registry, along with a service contract that specifies the nature of the service as advertisements. The requirements of the service, the usage and the fees would be mentioned as well. Service consumer - The service consumer would locate the service metadata and then develop the required client components. Following this, the client can bind the components and uses them. Data and information can be retrieved from other services or their workflows can be created by a service so that the request of a given customer can be satisfied. It is known as service orchestration. Service choreography is another necessary interaction pattern. It coordinates the interaction of services if there is no single point of control. The Oracle SOA suite includes a comprehensive set of components that are essential for the development, monitoring, and security of the Service Oriented Architecture. Oracle Mediator - This component is similar to the load balancers that route HTTP traffic. It routes the data to the external partners from the service providers. It can be used to publish the business events or subscribe to them. It is possible to design routing services and generate rules with the help of the Oracle Mediator. Oracle Adapters - The JCA technology is used by the Oracle Adapters to create a connection between the SOA Suite and the external systems. The technologies that are provided for data stores, transporting protocols and messaging middleware include BAM, Files, JMS or Java Messaging Service, FTP, Message Queuing and Advanced Queuing. Event Delivery Network and Business Events - Business events can be raised when an interesting situation arises. When some situation or occurrence takes place, the business events are generated and transmitted, for instance, the initiation of an order or its completion. Other application would be able to subscribe to an event once it has been published.Oracle Metadata Repository - The rulesets for the Oracle Business Rules, business events, the XML XSD schema files that are to be used in the Oracle BPEL Process manager, metadata files, WSDL files, the XSLT files for the Oracle Mediator and the Oracle Bus Service are kept in the Oracle Metadata Repository. Oracle Business Rules - The dynamic decisions allowed by the Oracle Business Rules mean that you can automate computations, constraints, policies and even reasoning. It is initiated by a BPEL component and separates the rule logic from the application code lying underneath. The business rule for the routing of messages can be used by the mediator component. These rules are kept in the Oracle Business Rules. Oracle WSM Policy Manager - The infrastructure that is required for auditing policies or ensuring global security is offered by the Oracle WSM Policy Manager. Setting and propagation of identity along with securing the various endpoints, it also secures the applications. The Policy Manager offers the standard mechanism that can be used for authentication, encryption, signing messages and role-based access control. It offers better flexibility and secure monitoring as the policy can be changed with the need to change the endpoints or the clients that are using them. Oracle BPEL Process Manager - The standard required to assemble any set of discrete services and develop an end-to-end process flow is offered by the Oracle BPEL Process Manager. The complexity and cost involved in the initiatives of process integration are radically reduced. Asynchronous and synchronous services can be orchestrated into the end-to-end process flows by the BPEL Process Manager. Spring Content - A lightweight container is offered by the spring framework that can be used for the myriad services. Instead of some specific component type, these containers can accept JavaBeans. The framework can thus be used in the creation of Java applications. Thus the spring context framework from the Oracle SOA Suite can help to use the Java interfaces in place of the WSDL files. Oracle is changing its products in a way so as to jump into the cloud bandwagon. The problem of Multitenancy is being addressed by Oracle with 12c. The following are some of the features that are new in Oracle 12c. Cloud Integration removes the barriers between enterprise applications through pre-built integration, machine learning, process automation, and embedded guidance. The product is unique in the market as it leverages the application expertise from Oracle to build a huge library of adapters to Oracle and the third party SaaS applications for faster business services. The solutions are fast, reliable and simple and offer a complete integration. The critical foundation for a product is offered by the Oracle Application Adapters. The reusable service assets publish and extract information from the on-premises and the cloud applications and these adapters help you to create them. The SDK is a set of tools, Java APIs and implementation classes that help you to develop the adapters. These adapters are that are created with the SDK are also known as the cloud adapter plugins. The Oracle Service Bus 12c presents companies with the option to deliver mobile solutions by extending the integration platform. The creation of customizable applications is simplified through the creation of JSON/REST APIs by the developers. Four crucial SOA standards offer the basis for businesses to develop their SOA solutions. Let’s have a look at them. SOA Ontology - It helps to improve the alignment amidst the IT communities and the enterprises. SOA Governance - This enforces how people and the solutions work in sync to achieve the objectives of the organisation. Open Service Integration Maturity Model or OSIMM - This standard offers the method that allows assessment of services and designs the blueprint to organisational success. SOA Reference Architecture - The options and guidance required for developing the design, implementation, and architectural designs are included in the Reference Architecture. Performance can be improved along with the upgradation of the system and the service functionalities. Applications can be developed without the replacement of the existing applications. Plugging in new services or improving the existing services to place new business requirements. Reliable applications are provided where independent services can be tested and debugged. High investment costs are required by SOA in terms of development, technology, and human resources. Greater overhead is offered when a service interacts within another. Machine load and response time are improved during the validation of input parameters. It is not available for applications with a GUI interface. To summarise, SOA is the style of software design where the services are shared with other components and a communication protocol is developed over the network. This protocol is independent of the products, technologies, and vendors. It acts as a black box for customers and is self-contained. It forms a logical representation of the business functionalities. It shares the principles with modular programming and offers the functionality required by large enterprises.